From the bird of paradise that performs an extravagant courtship dance in the rain forest to the bar-tailed godwit that flies thousands of miles across the ocean without stopping, readers can learn about incredible birds from all over the world with this strikingly illustrated gift book. In stylish linocut prints, Narisa Togo captures the beauty of both rare and familiar winged creatures from every part of the globe, presenting Japanese cranes, kakapos from New Zealand, and Andean flamingoes among the fourteen graceful birds on display. Narisa Togo is a printmaker and illustrator with a lifelong love of birds. She has a bachelor’s degree in ecology and a master’s degree in children’s book illustration. She lives in Japan. With loving attention to detail, Togo offers an elegant and incisive avian celebration. Togo's linocut illustrations are beautifully composed, judiciously colored, and observant renderings of the birds and their habitats and help to give life to the factual text (produced in collaboration with the British Royal Society for the Protection of Birds). Bird watchers from all parts of the world will appreciate this large collection of colorful reduction linocut artwork featuring some of the most majestic birds on our planet...This title is a perfect fit for bird enthusiasts and any artist looking to study representations of the magnificent birds that populate the world around us. This introduction to some of the world’s most amazing birds—largest wingspan (Wandering Albatross), longest bill (Australian Pelican), most unusual plumage (Great Bird of Paradise), and the furthest nonstop flight (Bar Tailed Godwit)—is a fabulous starting point for nature lovers and bird watchers. 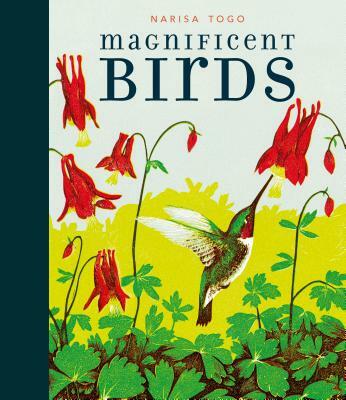 Good for browsing and learning about the versatility of birds, recommend for all collections.